Bordering between the fantastical and the real, Laetitia Soulier’s large-scale, “Fractal Architectures” photograph series are the result of meticulously constructed architectural interiors built at the scale of 1/24” to life-size and above. Each detail that makes up the entire oeuvre is treated as an individual sculpture or art piece, that when viewed in sync provides the viewer with a symphony of textures, colors, and patterns. Despite the time and care taken in building the miniature sets, once the photographs are taken, the sets are destroyed and the photographs remain the sole reminders of the artistic process. Each of Soulier’s images is in and of itself a study on the fractal patterns that are present in our daily lives yet rarely noticed. 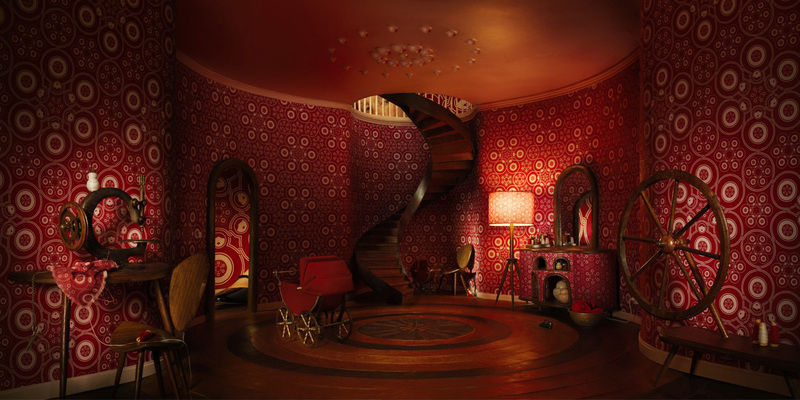 The series focuses on mundane living spaces transformed under a metaphorical lens that brings out the connection between the repeating shapes in the wallpaper, floor and ceiling patterns, design of the staircase, and bed sheets. Further emphasizing the kaleidoscopic effect of the fractal architectural patterns, the model is created in three different scales, one being larger than life- thereby bringing the viewer into this psychedelic world. The Palindrome Series, initiated in 2007, also explores the idea of connections found between the man-made world and man. At first glance, the arresting photographs draw you in, but it is only upon closer inspection that the blaring ironies reveal themselves. For example, the normally highly populated landscapes are unusually barren; one image is of an empty parking lot, another is of an empty subway, and yet another is of an empty train station. Where are all the people? The juxtaposed photographs present the only human connection, yet the twins in the photographs appear to be cut off from their surroundings. They seem to be alone, although they are together, and their poses echo the landscapes that they are disconnected from. Laetitia Soulier’s education in French Philosophy is very apparent in her work, as is her interest in modern scientific thought. It is this background that gives her work a depth rarely present in contemporary photography, and a unique perspective that invites viewers to engage in discussions that surpass the subject of her photographs.